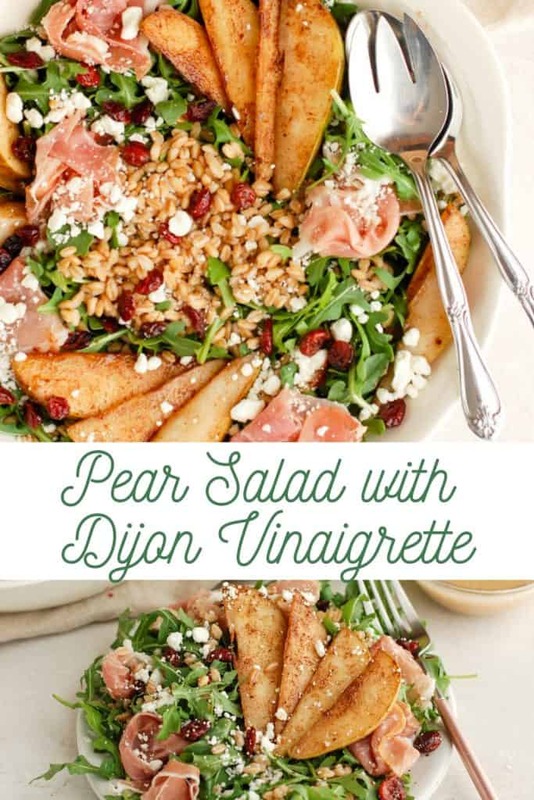 This deliciously healthy pear salad with Dijon vinaigrette is an easy dish that pairs well with your favorite entrée or eaten by itself! 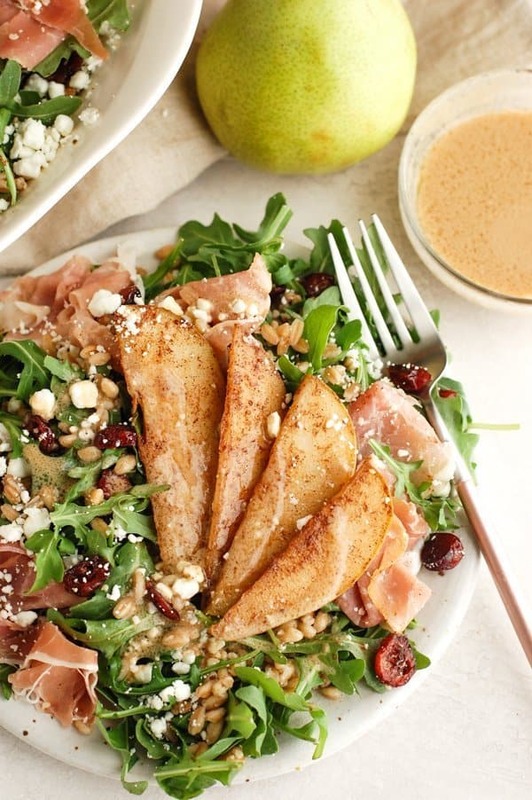 It is filled with sautéed cinnamon pears, goat cheese, fresh prosciutto, fluffy farro and a homemade mustard vinaigrette. One of my favorite things to do when it comes to hosting is to create healthy dishes for everyone with ingredients that they typically wouldn’t have put together on their own. I love doing this with a big salad. It truly let’s me be as creative as I want because a bed of greens is basically like a blank canvas, waiting to be doctored up! When creating a big salad, there are so many different options between the different type of greens your going to use, to the different toppings that will layer the salad, right down to the dressing. 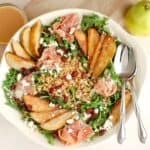 The base of the salad always changes for me, as I like anything from fresh romaine to spinach, to even arugula, as I did with this delicious pear salad with dijon vinaigrette. When it comes to thinking about what toppings I want to use (my favorite part!) I like to make sure there is a balance of ingredients. A little sweet, typically from some sort of fruit, a little salty, typically from cheese, and then crunch because every salad needs crunch! So I chose to add goat cheese and prosciutto for a salty kick, farro for a little bit of a chew, homemade vinaigrette for a little bit of tang, and sautéed pears for a sweet kick. I sliced up a bunch of USA Pears Anjou pears, sautéed them in a little bit of butter and cinnamon, and added them right on top. Did you know pears are loaded with nutrients? One pear has six grams of fiber and is a good source of vitamin c. They also contain just 100 calories with no sodium, fat or cholesterol. Research shows pears may help in managing gut health, supporting probiotic bacteria with soluble and insoluble fiber. Fresh, hand-picked pears from the Northwest are sweet, juicy and flavorful. The pastoral orchards of Washington and Oregon produce 88% of all fresh pears sold in the USA. How do you know when a pear is ripe? Simply check the neck! Press at the top of the pear near the stem. If it yields to pressure, it’s ripe and ready to eat! My parents used to always pack a pear in my lunch when I was going to school, and I used to always be so excited when they were sweet and ripe! Little did I know they were actually full of healthy fiber too. This blog post was sponsored by USA Pears. All opinions are my own. 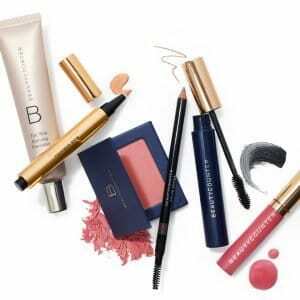 I am so thankful to work with wonderful partners who help to keep this blog afloat! 1. Wash and dry pears, then slice into ½ inch thick pieces. 2. In a sauté pan, heat 1 tsp butter. 3. Add pear slices on top, then add cinnamon and stir till well coated. 4. Let sauté for 3 minutes on each side, stirring a couple times throughout. 5. Remove from heat and let stand. 6. 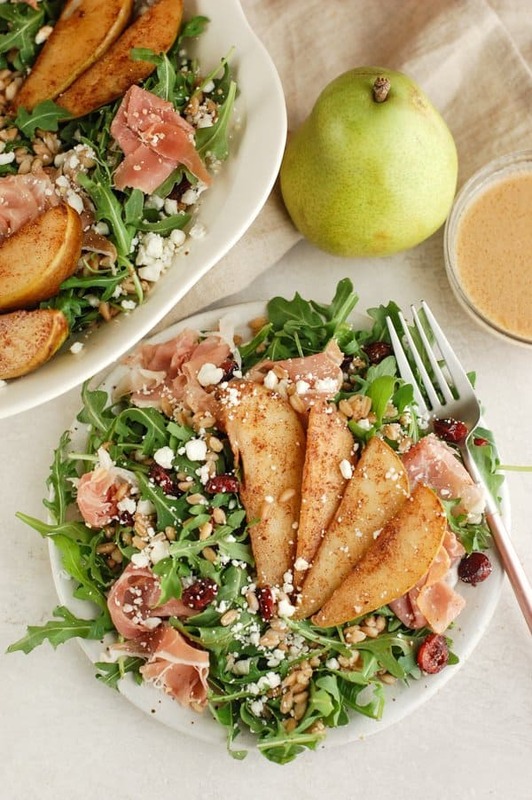 While pears are cooling, make the dressing by whisking together Dijon mustard, olive oil, red wine vinegar, and salt. Set aside. 7. Pour arugula into a large bowl. 8. 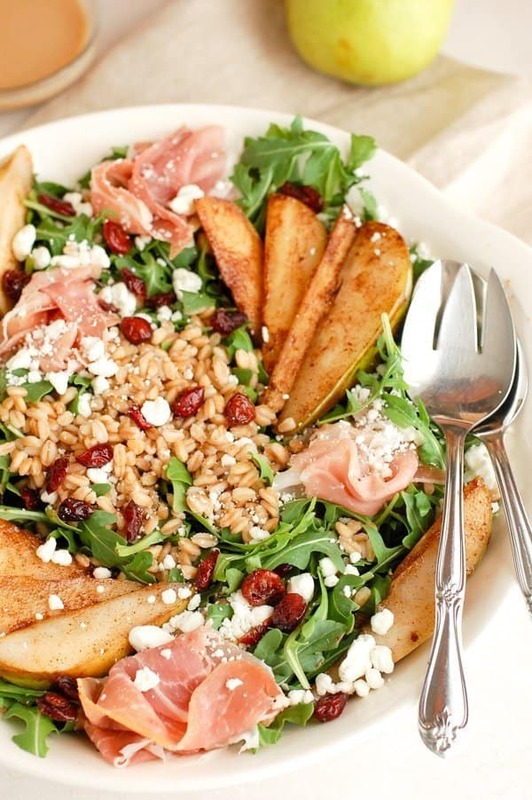 Top with farro, prosciutto, goat cheese, dried cranberries and then pears. 9. Drizzle dressing overtop and toss to coat. 11. Store in fridge for up to 3 days.